On Sunday March 2nd 2014, Cheryl’s Cookies had the privilege of teaming up with the world’s first child protective agency, New York Society for the Prevention of Cruelty to Children (NYSPCC), to deliver smiles to some of New York City’s children and families. Fifty families participated in the NYSPCC Family Benefit 2014, making once-in-a-lifetime memories with their new friends and family members. The day of family fun began with a VIP lunch reception in the heart of dazzling Times Square at Aureole, where they snacked and savored to their heart’s content on the restaurant’s signature American dishes. At the completion of the luncheon, guests were treated to a VIP gift bag filled with toys and treats, including Cheryl’s famous buttercream frosted cookies. The afternoon continued with a trip over to the New Amsterdam Theatre, where guests enjoyed an awe-inspiring performance of Disney’s Aladdin on Broadway, viewed from some of the hottest seats in town. this season is a time for a fresh start and new beginnings. Once the season’s first flowers come out of their winter hibernation and start peeking through the frozen blades of grass, we know its time to shed the winter blues and prepare for the season of life and growth. That’s why this year, we are celebrating spring by immersing ourselves in all things floral! Here are some creative ways to celebrate spring with flowers; gather the troops and make this a spring celebration for the whole family! What better way to ring in the season than with a batch of Cheryl’s FAMOUS buttercream frosted cookies shaped like flowers?! 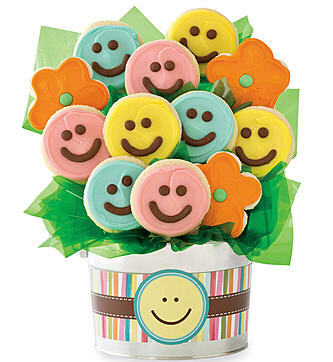 Send a cheerful Cookie Flower Pot of buttercream frosted cookies to those you love to help spread the spring cheer! Take the whole gang out for a day of fresh air and flower identifying! Make it an educational (and fun) experience by bringing along a book of plants to help point out and bring attention to the plants growing you encounter along the way. Have kids gather flowers from your backyard or the local park and add them into their own collection box! Use mod podge or similar adhesive to secure the flower on the page; provide the children with markers so they can label the flowers accordingly for a creative and educational experience! The simplest fun yet festive way to celebrate spring is by simply gathering flowers and creating your own bouquet! Dress up your vase with a seasonal ribbon and you have a beautifully fresh decoration for the home. Even if you don’t have a garden, gather the family and plant a flower or seed altogether! As your family grows so will the seedling sprout into something beautiful and new. Surprise friends and family with a slice of spring delivered right to their mailbox with our charming Cookie Cards! International Women’s Day is a celebration of all the wonderful women who help navigate the successes of each day. Celebrated on March 8, it is a day of relaxing (for the ladies), gifting, and showing appreciation. Wondering what to get the special women in your life for International Women’s Day? We’ve got the ultimate cookie-packed gift guide to make the celebration extra sweet! Traditionally, flowers or treats are gifted on this special holiday. But why choose just one? Combine the best of both worlds and give a cookie flower tin filled with sweet floral inspired treats! Cookies, and muffins, and cakes, oh my! Surprise the ladies of the office with a drool-worthy basket full of our most popular treats – sized to share so all the ladies of the office can enjoy. Add a simple “thank you” message so your coworkers know just how much they are appreciated! Don’t forget the women-in-training! March 8 is all about celebrating females of all ages, so send a special surprise to daughters, granddaughters, neighbors and friends with a gift from our Happy Face collection! Popping open a tin full of bright, smiling faces is sure to put anyone into the festive spirit! 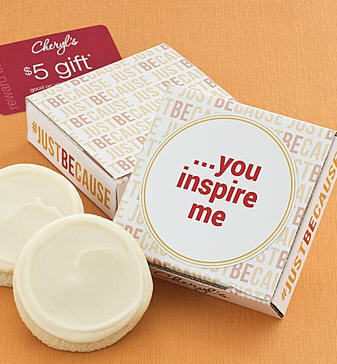 Celebrate your own personal feats and accomplishments by “surprising” yourself with an assortment of your favorite Cheryl’s cookie treats from the Create Your Own collection! 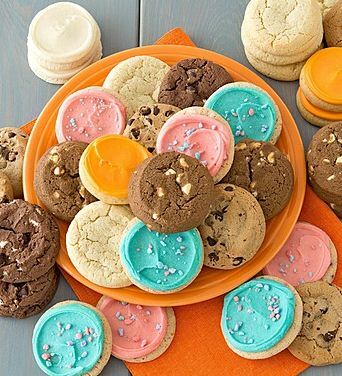 Our cookies are great for freezing, so indulge in a few upon opening and save the rest for a midnight snack! Did you know that February is Creative Romance Month? You may be planning a wow-worthy romantic night out for Valentine’s Day, but don’t stop the celebration there! Make all 28 days of this romantic month equally special with a bit of planning and sweetness. Here are 10 creative date night ideas you can have right from the comfort of your own home! So whether the streets are snowy or the skies are sunny, you and your special someone can make this February one they’ll always remember. 1. Dinner and a very special movie. Dinner and a movie is a no-fail date idea, but why not make it really special by reliving one of the first moments as a couple? Rather than simply loading up your movie queue, hunt down the first movie you two watched in theaters together. If you can remember which snacks you ordered, be sure to stock up on them! Your sweetie’s stomach is sure to be filled with those same butterflies that were fluttering when the two of you first met. 2. Have an indoor picnic. Set down that checkerboard blanket and have a relaxing picnic from your living room! Open all the blinds and let the rays of sunshine peek through as you sip on wine and sample cheeses. Make this as fancy as you’d like; take this opportunity to share any unspoken thoughts as you gaze lovingly into each others eyes. 3. Have a second first date. Similar to watching the first movie you two saw together, travel back to a simpler and sweeter time by staging your first date from your home. Serve the same meal or cuisine, invite the friends you were with at the time, or turn your home into the venue you enjoyed. If you went to the town fair, set up a few carnival games and serve funnel cake. Get creative and make it special! 4. DIY together. Pick a simple project the two of you can do together. Whether you’re decorating, reorganizing, tackling a difficult yet delicious recipe, or simply decorating cookies, the success is in the quality time spent together. 5. Relive the memories. Grab that dusty stack of photo albums out of the attic and relive the memories you had together. If your relationship is fairly new, this is a good opportunity to go through old baby albums and learn a bit more about your special someone. 6. Do a wine tasting at home. Does your sweetie have sophisticated taste? Set up a tasting for the two of you to discuss! Keep track of the comments your companion makes – this information may come in handy when planning dates in the future. 7. Plan your dream vacation. Whether or not you actually have the vacation time, discuss the vacation of your dreams together. This is not only a great way to break up the monotony of the day, but also a fantastic way to learn a bit about each other. You may be surprised to learn that your sweetie’s dream vacation is snorkeling with sharks or snowboarding off highest mountains! 8. Make a scrapbook. Rather than just putting photos in an album, get crafty by turning those photographic memories into a stunning scrapbook! Use themed paper and stickers to turn this project into something the two of you will love showing off for years to come. 9. Plant a special seed. While February is still relatively chilly, there are some plants such as tomatoes and peppers that can already be planted. Choose one seed and plant it with your sweetie in a special spot. Like your love, this plant will grow with a little bit of love, patience, and TLC. Once the plant is grown, show it off or enjoy it with romantic meal! 10. Have a game night. Keep the games PG or add your own romantic twist to them for a more sensual evening – the possibilities are endless! You must have a Celebrations Rewards® account (https://www.cheryls.com/celebrations-rewards-cookies) to earn points. Post a great photo or story with the hashtag #CherylsCookies and mention @CherylsDesserts on Twitter or and @cherylscookies on Instagram and receive 50 points. Limited to one time per month, offer ends 12/31/2016. Post a great photo or story with the hashtag #FreeCookieFriday and mention @CherylsDesserts on Twitter or and @cherylscookies on Instagram and receive 10 points. Limited to five times per month, offer ends 12/31/2016. Please allow 5-7 business days for your Celebrations Rewards points to be added to your account. Receive a $20 Savings Pass good across our Family of Brands for every 200 points earned. Click the “sign up” button and select a social channel. Sign into your social profile. If you’re already signed in, you will be re-directed back to the registration page. Enter your information and click the “complete” button. Use the link to follow @CherylsDesserts on Twitter and @cherylscookies on Instagram to find out more ways to earn Rewards points. Be sure to set your social profiles to “public” so we can reward your posts! Q: I tried to register for Celebrations Rewards social engagement promotions, and I’m getting an error message. What’s wrong? A: Make sure you are using a valid Celebrations Rewards® account, and that the email entered matches the email on your Celebrations Rewards® account. To confirm your Celebrations Rewards® account and email, go to https://www.cheryls.com/webapp/wcs/stores/servlet/LogonForm. Q: How do I earn points through Celebrations Rewards® social engagement promotions? 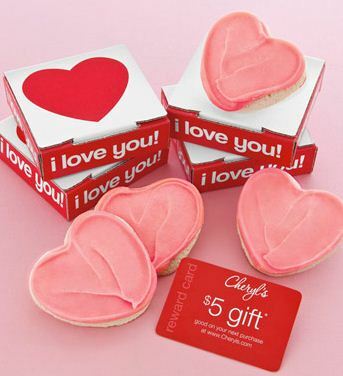 A: Follow @CherylsDesserts on Twitter (https://twitter.com/CherylsDesserts) and @cherylscookies on Instagram (https://www.instagram.com/cherylscookies) to learn about the latest promotions. Be sure to set your social profile accounts to “public” so we can reward your posts. Also make sure you are opted-in to our Email program. Q: How many points can I earn? A: Each promotion is unique. Be sure to read the rules in the Terms of Offer. I just performed a qualifying social action. How do I know that I received my points? A: You will receive a confirmation email stating how many points you earned. Your account may take 5-7 Business Days to reflect your new current point balance. You can look at your Celebrations Rewards® account profile at https://www.cheryls.com/webapp/wcs/stores/servlet/LogonForm to view activity and point balance. Q: I just performed a qualifying social action and did not receive my points. What happened? You might have hit the maximum number of times you can earn for the social campaign. You must be a Celebrations Rewards member in order to earn points. Your account may take 5-7 Business Days to reflect your new current point balance. If you’re still having trouble, contact Customer Support at loyaltypriority@1800flowers.com. I’m not currently a Celebrations Rewards® member; can I still earn points? How is Cheryl’s going to use my information? Q: Will Celebrations Rewards® automatically post on my social profile accounts? A: No, Celebrations Rewards® will never post on your behalf or contact your friends. What happens if I change my email address associated with Celebrations Rewards®? A: You will forfeit your Bonus Points if you change your Celebrations Rewards® email address. You can contact Customer Service at loyaltypriority@1800flowers.com and they can update the email address you want associated with your Celebrations Rewards® account. Q: How do I opt out of Celebrations Rewards® Social Engagement promotions? Thanksgiving is over and now Christmas is approaching quickly! With that in mind, I have come up with 10 reasons why you should give the gift of cookies and other sweet treats this year. Your shopping is almost done and you’ve never been happier. Unfortunately, you have two people left on your list and can’t think of a single thing to buy them. Buying gifts for these people can sometimes be the most challenging task during the Holidays. The recipient is either too picky, wants something out of your price range, he/she couldn’t think of anything to ask for, or has everything already. I am faced with this dilemma year after year: What do I buy? Fortunately, after working at Cheryl’s I have been exposed to the solution to all of my shopping woes. Cookies! I am not a baker by any means; being able to purchase a product that I know will taste homemade is an added bonus! Here are the top ten reasons why I think giving cookies is the best solution for the hard-to-buy recipient. Great for any age: no matter if the recipient is five or 85, who doesn’t love cookies! Browse Cheryl’s Holiday Collection to find the perfect gift for everyone on your shopping list. Order now, ship later. Happy Shopping! See how people everywhere are celebrating moments, big and small and taking the opportunity to express themselves. Join us in making the moment count – and do it #justbecause. Cheryl’s offers a variety of sweet and indulging gift ideas for every special moment! Just Because… It’s your birthday! A sweet birthday gift perfect for friends and family, neighbors and co-workers! 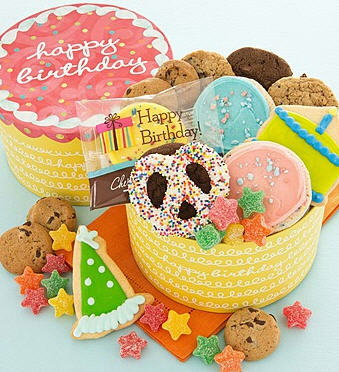 Our cute birthday tin is filled with yummy treats including buttercream frosted cookies, snack size cookies, gummy stars, snack size crunchy cookies, hand decorated crunchy sugar cookies, and a deluxe drizzled pretzel. Just Because… You had a bad day. A gift that makes you smile – perfect for any occasion! 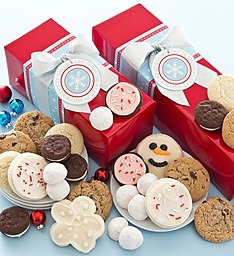 We’ve included our famous buttercream frosted cut-out cookies delivered in a shiny silver pail. Just Because… You stole my heart. A yummy pink heart cookie delivered in a pretty box is sure to get a reaction! Best of all, we’ve included a $5 Reward Card to use on a future purchase at Cheryl’s. Just Because… You’re my hero! Our delightful cookie card includes a FAMOUS individually wrapped Cheryl’s buttercream frosted cut-out cookie tucked inside a cheerful gift box. We’ve also included a $5 Reward Card to use on a future purchase. Every birthday is an occasion to celebrate, but big milestone birthdays are the ones we remember our whole lives through. They’re a rite of passage—a sign of life achievement. So if someone you love is turning 16, 21, 30 or 50, such an epic moment calls for an equally monumental birthday present. Here are a few gift ideas to make every milestone birthday an event for the history books! Nothing is more exciting than turning 16: Childhood days are left behind, and fun teenage years—filled with possibilities—are up ahead! Make her sweet 16 even sweeter with these dessert-themed gifts. Turning 21 isn’t just about discovering yourself before you become a full-blown grownup; it’s also about indulging in the best things life has to offer! These gift ideas will really help your favorite 21-year-old let her hair down and enjoy her carefree days. As an established adult at 30, chances are your loved one is juggling work, family and a super-hectic schedule. Let her kick up her feet and take a mini vacation from her responsibilities on her 30th birthday with these easygoing gifts. Just as wine becomes more delicious with age and brings families together to make memories, so does life at 50. These gifts give your loved one the finer things she desires on her 50th birthday: gourmet flavors and, more importantly, the love of family. Send Your Coz a Sweet Gift for Cousins Day! They aren’t just your aunts’ and uncles’ kids. They’re your best friends. They’re your siblings from another mother. They’re your partners in crime at family get-togethers. They’re your cousins, and your family wouldn’t be the same without them. And because our cousins are so special, they even get their own holiday! Mark your calendars: Cousins Day is coming up on July 24! Celebrate your sweet family connection by sending your coz a scrumptious little treat. Whether they live right around the corner or all the way across the globe, sending them a cookie greeting in the mail is the perfect way to show your cousin how much you love them. It’s much sweeter than a card, it can be delivered anywhere and it only costs $5! 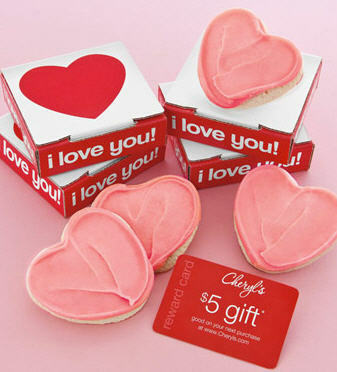 Plus, each cookie comes with a $5 Cheryl’s Reward Card, so the deliciousness of Cousins Day can last even longer. Show your favorite family member a whole lotta love with a heart-shaped Love Cookie Greeting, or put a big, bright smile on their face with a colorful Happy Face Greeting. For the ladies, a cheery Have a Great Day Cookie Greeting is sure to make their holiday memorable. For the gents, the sporty Football Cookie Greeting will definitely score a touchdown as the best Cousins Day gift ever! Each ultra-soft cookie is frosted with Cheryl’s out-of-this-world buttercream icing, so you’ll win your cousin’s heart, no matter which kind of cookie greeting you give them! And remember: If you have a cousin, that means you are a cousin, so this is your holiday too. Make sure you grab a cookie greeting for yourself, because there is no cousin sweeter than you! How do you plan on catching up with your cousins on Cousins Day this year?